The Roman Camp in Bonn was situated in the northern part of the modern city. Its square form (520 x 516 metres) was crossed by two main streets. Even today the Roman Camp can be recognized in our street pattern. In the south the camp borders on Rosenthalstraße, in the west on Graureindorfer Straße and in the north on Augustusring; the streets "Am Schänzchen" and "Am Wichelshof" show the eastern borderline. The modern Römerstraße is the old Via principalis, which ran through the camp from north to south. Towards the Rhine the Badenerstraße, the former Via praetoria, and to the west the Nordstraße, the former Via decumana, branched off. Via decumana und Via praetoria divided the camp between east and west, whereas more streets running from north to south subdivided the camp into six stripes, the so-called scamna (singular: scamnum). The Principia, the main building of the camp, interrupted the street running from east to west. It was a four-winged building surrounding a big inner courtyard. In the northern, eastern and southern wings there were offices and assembly rooms, as well as archives and arsenals. The western wing contained the so-called basilica, a hall for trials and offical events; apart from that the shrine for the flag, the legion´s eagle and the standard were kept here. At the eastern edge of the Via principalis, in the third scamnum, there were the flats of the tribunes, of the commander of the camp, and of the officers of the reinforcements. Right next to it and north of the Principia wounded legionaires were nursed in the valetudinarium, the military hospital. In the camp there were also farm buildings, storage buildings and workshops, where the immunes lived. These were people who worked in the administration of the Principia and in the farm buildings, and the doctors working in the nearby military hospital. Their loggings were west of the Principia. The barracks of the legionaires were right next to the walls of the camp in order to be able to reach the facilities of defense as fast as possible when there was an attack. After its re-erection (70-79 AD) the camp was protected by a stone wall with battlements. In front of the outer wall a double moat had been dug and behind the wall a rampart served to carry the path on top. Moreover each of the four gates was protected by double towers. 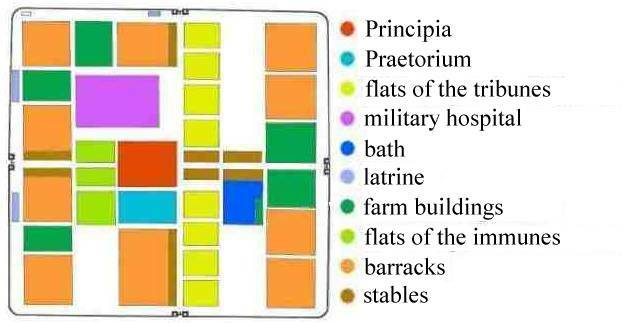 In 43 AD the first legion, the Legio I Germanica, was transferred to Bonn where they built up the camp. The first buildings were erected in the way of timber-framed houses. Only later, in 52 to 54 AD, they began to build stone houses. In 69 AD Vitellius, commander of the lower-Germanic army, moved towards Rome with about 40000 men, among them several of the Legio I Germanica. He wanted to be proclaimed Emperor after Nero´s death. In the area where now significantly less legionaires were stationed the rebellion of the Bataver broke out. The main troop of the Legio I Germanica, which had stayed behind in Bonn was defeated by the Bataver and the Roman Camp was destroyed. After that the survivors of the legion deserted to the Bataver. This was another reason for their later desintegration after the suppression of the uprising. The Legio XXI Rapax was called to Bonn and began to rebuild the camp with stones finishing only nine years later. In 83 AD they were ordered to go to ancient Upper-Germany and within the same year they were substituted by Legio I Flavia Minervia. With this new legion a longer period of peace came to Bonn. We also know that Domitian during his preparations for the Chatten-war had destroyed this legion and that under Traian they had taken part in the Dakien (today Romania) military campaign (101- 109 AD) and in the military campaign against the Parther under Marcus Aurelius.